A deployment update blueprint is a blueprint that contains the requested state of the deployment after the update. It is a normal and valid blueprint, that can be used to create new deployments as well, like any other blueprint on the manager. Since version 4.4, the blueprint is not uploaded specifically for the update, like in older versions. Instead, a blueprint that is already on the manager is used (passed by blueprint id). A step is a logical concept that represents a single change in a deployment update. There are three different types of steps, add, remove, and modify. The scope of a step is determined by its most top-level change. For example, if a node is added that also contains a new relationship, this is an ‘add node’ step, not an ‘add relationship’ step. Similarly, if a node’s property is modified, it is not a ‘modify node’ step, but a ‘modify property’ step. A list of all possible steps is located here. After you apply a deployment update, its composite steps are only accessible using the Cloudify REST API. The contents of the deployment update must be described in a yaml blueprint file, just as any with application in Cloudify (note that the blueprint represent the desired state of the deployment after the update). Using the example described in the introduction, the updated application blueprint would include a new database type, some new node templates of the new database type, and some new relationships that represent how these new nodes connect to the existing architecture. 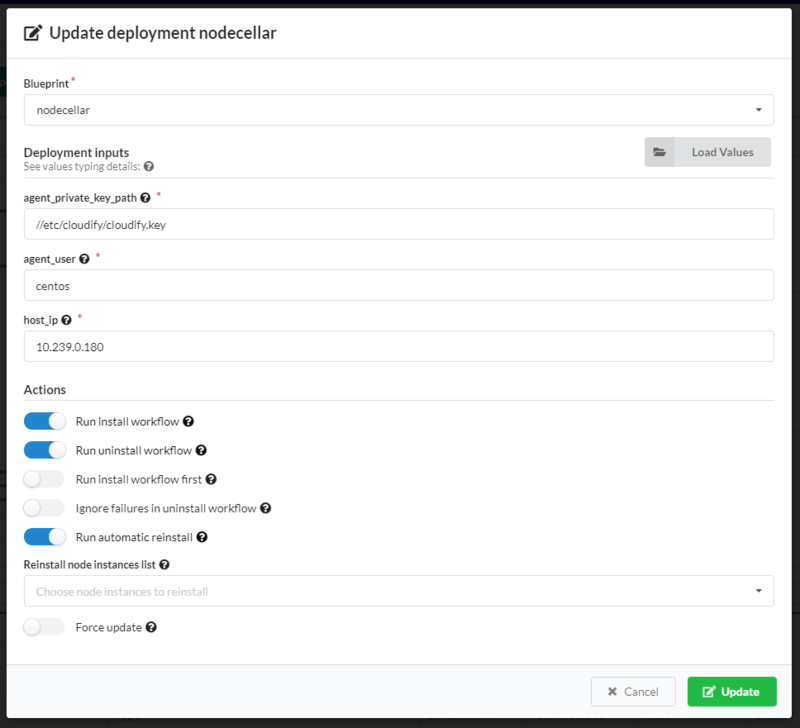 Like any other workflow, the built-in update workflow must be a part of the deployment update blueprint in order to update a deployment using it. The recommended way of achieving this is to import types.yaml (v.3.4, or later) to your blueprint. The steps composing the deployment update are extracted. All the ‘added’ and ‘modified’ changes are updated in the data model. The unlink operation is executed in regard to each removed relationship. The uninstall workflow is executed on each of the removed nodes. Old plugins that were outdated are being uninstalled. The install workflow is executed on each of the added nodes. The establish operation is executed in regard to each added relationship. New plugins that were updated are being installed. The reinstall workflow (uninstall and install) is executed on each of the modified nodes and each of the nodes that were explicitly marked for reinstall. All ‘removed’ changes are updated in the data model. Stage 3 of the deployment update flow comprises only the cases in which a workflow or an operation is executed during a deployment update. That is, when changing description, removing a workflow, modifying the install-agent property or any other step that is not add/remove/modify node or relationship, no workflow or operation is executed. Note that since version 4.4, modifying an existing node (changing its properties and/or operations) will cause automatic reinstallation of this node, unless the flag --skip-reinstall has been supplied. On the Deployments page, click on the menu icon on the right side of the deployment row and click Update. On the Deployments page, click on the deployment row to go into deployment’s page and on that page click Update deployment button. set specific Actions to be taken upon deployment update like enabling/disabling Install/Uninstall workflows on specific node instances. You can update your deployment using the CLI. Updating a deployment via the CLI is similar to creating a deployment, besides the fact that you supply an argument of the existing deployment’s id. You must also supply either a blueprint id or new inputs (or both) for the deployment update to use. The deployment’s blueprint and inputs will be updated in the data model. See more of the CLI usage in the CLI deployments documentation. Nodes that were modified in the update (their properties and/or operations) were changed, will be automatically reinstalled, so the modifications will take affect. It is possible to avoid automatic reinstallation of modified nodes, by supplying the flag --skip-reinstall. It is also possible to manually supply a list of node instances to be reinstalled by using the parameter --reinstall-list or -r. This parameter can be passed multiple times in a single command, to pass a list of node instances ids. Those node instances that were explicitly supplied will be reinstalled even if the flag --skip-reinstall has been supplied (in fact, the flag --skip-reinstall is for skipping only the automatic reinstall of modified nodes). Note: If node’s properties that are required for the node’s uninstallation has been modified, it is recommended to use the --skip-reinstall flag, since the reinstall takes place after the properties has been updated in the data model, and the original properties that could be required for the uninstall may no longer exist. In those cases it is recommended to either split the update into 2 phase that will be performed in 2 different updates (removing the old nodes and then adding the updated ones), or to change the node names in the blueprint, to have them being treated as different nodes. It is also recommended to use the --skip-reinstall flag in case of a plugin update that may cause reinstallation of all the nodes installed by this plugin, that may not be necessary (especially central deployment plugins, e.g: update of the openstack plugin may trigger automatic reinstallation of all the openstack nodes). It may be wise to update plugins in a separate deployment update dedicated for this action. In case of changed properties that are not critical for a successful uninstallation, but can still cause some of the uninstall tasks to fail, the --ignore-failure flag can be used, to ignore those irrelevant failures and move on normally (more on that later). You can skip the execution of the install and/or uninstall and/or reinstall workflows during the deployment update process. If you skip the install workflow, added nodes are not installed, added relationships are not established and updated agent-host plugins are not installed (central-deployment plugins are not effected). If you skip the uninstall workflow, removed nodes are not uninstalled, removed relationships are not unlinked and outdated agent-host plugins are not uninstalled (central-deployment plugins are not effected). If you skip the reinstall workflow, modified nodes are not reinstalled automatically (nodes that were manually chosen to reinstall will still be reinstalled). You can explicitly supply a list of node instance ids to be reinstalled as part of the update. They will be added to the list of modified node instances that need to be reinstalled. Even if the flag --skip-reinstall was supplied, the nodes that were explicitly passed to the reinstall list will be reinstalled. In this case, when the update will take place all the nodes that were modified and all the nodes that were passed to the list will be reinstalled. If a node instance id is illegal (the node instance either doesn’t exist, about to be installed or about to be uninstalled) an error will be thrown and the update will not take place. In this case, only the node instances that were explicitly passed (NODE_INSTANCE_ID_1, NODE_INSTANCE_ID_2) will be reinstalled. The node instances that were modified will not be automatically reinstalled. Like any other workflow, retry the task until it succeeds (and then move on to the next task), or until reached the maximum retries number (and then fail the execution). This is the default behavior. Ignore the failure and simply move on to the next task (this methods assumes that a failure in uninstall workflow is not critical and less likely to have negative affect). This behavior is used when the parameter ignore_failure is set to true. In this case, all failures in tasks that are part of uninstalling nodes will be ignored, and the update will continue as planned. Some of the nodes that has to be uninstalled/reinstalled are damaged and their uninstallation may not work perfectly. The nodes that are being uninstalled have properties that were modified in this update and are being used at the nodes uninstall workflow (but not necessarily critical to its success) and the fact that they were modified may fail some tasks. This update is a roll-back after a failing update, so it is likely that some of its tasks will fail (uninstallation of nodes that were not installed properly in the original update). If a deployment update workflow fails during its execution, you can try to perform a force deployment update to recover, using the -f flag. A common solution is to attempt a ‘rollback’, using a deployment update blueprint that represents the previous deployment. By default, the update workflow first uninstalls deleted nodes, then installs added nodes and at last - reinstalls modified nodes. The --install-first flag can be used to run install before uninstall (not recommended since some resources required for the nodes that are about to be installed may still be taken by the nodes that are about to be uninstalled). If you provide an input with the same name as an existing deployment input, it overrides its value. Other new inputs will be added to the data model as usual. Any new nodes (including new webserver nodes) that were added as a part of that deployment update and use the port input, are assigned with the new port input value - 9090. The overriden input will cause a modification in the webserver node (his port property was changed). This will trigger an automatic reinstallation of all the instances of the webserver node, so the updated port will take affect. If the --skip-reinstall flag was passed, automatic reinstall will not be triggered, and although the input was overriden to 9090, the actual port on the existing server will remain 8080. Since the blueprint has to be uploaded before using it to update the deployment, it has to be a valid blueprint that can be used to create new deployments as well. Therefore, each resources that are being used in this blueprint must be imported or attached to it (cannot rely on resources from the original deployment blueprint). Any resource (scripts, data files, etc.) that will be uploaded with the same name as a resource in the original deployment, will overwrite it. However, entries from the imports section that were part of that deployment’s blueprint, or of a previous deployment update, must also be a part of the deployment update blueprint. 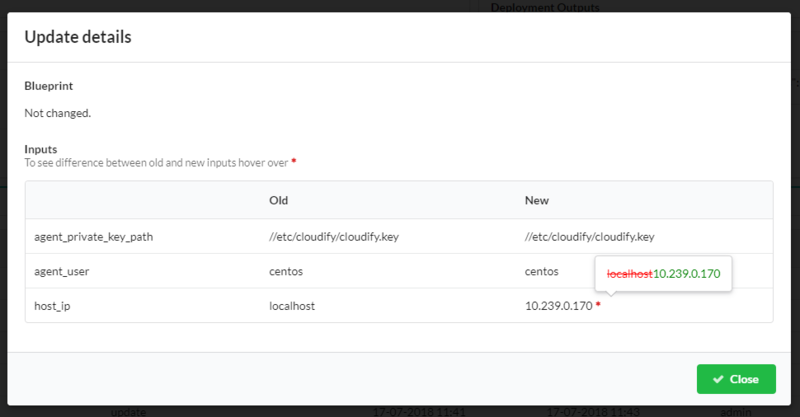 For example, if the http://www.getcloudify.org/spec/cloudify/4.4/types.yaml entry was contained in the imports in the blueprint of the original deployment, the deployment update blueprint must also contain the content of that file. (This is generally achieved by importing the same types.yaml file, or a newer version). If a deployment update blueprint contains changes that are not currently supported as a part of an update, the update is not executed, and a message indicating the unsupported changes will be displayed to the user. Following is a list of unsupported changes, together with some possible examples. You cannot change a node’s type. type: my_updated_type  # unsupported update - can't modify a node's type! You cannot change the target value of a cloudify.relationships.contained_in type relationship, or any type that derives from it. You cannot change a relationship’s property, for example, connection_type. You cannot make changes in the top level fields groups, policy_types and policy_triggers as a part of a deployment update blueprint. The following can be updated as part of a deployment update, subject to the limitations that were previously described in the Unsupported Changes section. You can add or remove nodes, including all their relationships, operations, an so on. Remember that adding or removing a node triggers the install/uninstall workflow in regard to that node. Assume that the original deployment blueprint contains a node named node1. Then, in the deployment update blueprint, you decide to ‘rename’ that node, to node2. Now the deployment update blueprint’s node2 is identical to node1 in the original blueprint, except for its name. But in practice, there isn’t really a ‘renaming’ process. In this scenario, node1 is uninstalled and node2 is installed, meaning that node1 does not retain its state. With the exception of being added or removed as part of adding or removing a node, you can add or remove relationships independently. Adding a relationship triggers an execution of its establish operations (assuming a default install workflow). Similarly, removing a relationship triggers an execution of the unlink operations. You can also change a node’s relationship order. The operations of the added and removed relationships are executed according the order of the relationships in the deployment update blueprint. You can add, remove or modify node operations and relationship operations. You can add, remove, or modify properties. Note that overriding a default property value is treated as a property modification. You can add, remove or modify outputs. You can add, remove or modify workflows. You can add, remove or modify plugins. In this example, plugin-name-1 will be updated from version 1.0 to version 2.0, plugin-name-3 will be added to the deployment, and plugin-name-2 removed from it. In cases of updating a plugin that was used to install nodes in the deployment (for example, openstack plugin used to install openstack nodes), the plugin update may trigger automatic reinstallation of those nodes. It can be avoided by using the --skip-reinstall flag. Note: it is possible to import plugins without stating a specific version. In this case, the newest plugin available with the matching name and distribution will be used. The plugin is being associated with the blueprint when the blueprint is uploaded, so it is possible that the same blueprint that was uploaded twice will be associated each time with a different plugin version. When updating a deployment with a specific blueprint, the plugins that will be used in this deployment from now on are those associated with the blueprint. So updating a plugin’s version in a deployment can be done by uploading the same blueprint again without any changes, if a newer plugin is available (and this version update can also happen unintentionally and needs to be considered). You can add, remove or modify the description. The blueprint you provided for the deployment update contains changes currently unsupported by the deployment update mechanism. This problem originates from a DSL issue, and will be resolved in versions 3.4.1 and above. To mitigate this problems, use a types.yaml of version 3.4 and above, or at least use the policy_types section of it.